This month we have a sale of assorted dies and our fabulous Bloom Collection of jewelry. I have a number of pieces of jewelry and since today is my Holiday Open House I want to share my newly decorated piece. This gorgeous necklace is made up of a number of pieces. The chain is the 27.5" Diamond Cut link. I didn't take a close up of it but it is fabulous. 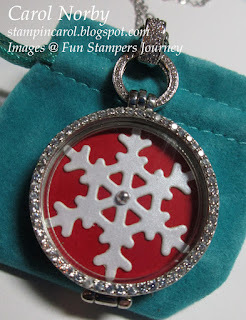 The locket is the large Sparkled Round Locket. Look at the cool "jewels" around the circle! I just got the Crystal Ring & Hoop which makes it so much easier to attach the chain. You do need the appropriate sized Locket Kit to encase the locket as it's just a frame. I used our Punch Handle and 1 1/4" Punch Cartridge and Candy Apple card stock for the background. Next I used the smallest die only from the Snow Burst Bundle and Pearl Paper (and, of course, our Amaze machine) to make the snow flake. Last a little Fashion dot for the center of the snow flake. Though this isn't exactly a Christmas design I though winter would work. What do you think?